I give of my Spirit to creatures everywhere. And dances to prosper the Whole. Born from the Womb of the Drum. I cannot imagine living without drumming. If I didn't have a drum, I'd probably be using stones, sticks, forks, anything to evoke and sustain the rhythmic pulses that are the beating hearts of me and of Drum. I have been teaching and leading Women's Circles for seven years. I am now finishing the sacred cycle of seven years, entering a new phase of my work with Women's Circles. Playing my various drums is the way I am carried and the way I carry me through these years, these changes and transformations. What I seek to emphasize in talking about drums and beaters is that the "way, method, and tool" with which we approach, enliven, and use our Drums is primary to what kind of relationship we establish with our Drums. This relationship, in turn, effects the power available in our drumming in Circles, in individual spiritual practice, and in healing. I've noticed people pick up "any ole" beater with which to play their drum; often the same people will simply "beat" their drum with little regard to how they are beating. We are aware in our culture of the violence involved in battering and beating another being. So I seek to bring to our consciousness that our Drums are living beings. If we treat them as we would our best friend, then this relationship will weave a blanket of splendor and joy around and over our journeys through this world and for those whose lives we touch. 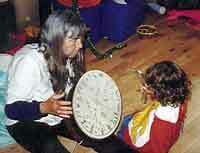 I use the Drum in every Circle as well as in my personal spiritual practice. In all circumstances, before every drumming, I offer a prayer of thanks, remembering all who have drummed before me and kept this spiritual, rhythmic pulse alive in the Universe. With the first beat, we create an opening for the Spirits; visions, images, and teachings come pouring through this opening. At some point in each Circle, we focus on the healing power of the Drum. We use the drums over and around the bodies of each other; particular vibrations have the ability to amplify the healing powers within an individual or a group of people seeking help. It is my experience that some drums wish to be used only for this purpose; their healing power is sustained by reserving them for those occasions when healing is being sought. Women drumming together, especially for prolonged periods, create perforations in the membranes of our consciousness, our habituated selves, and our conditioned bodies. Being perforated, we now have access to receiving new wisdom with the ability to transform ourselves down to the cellular level. 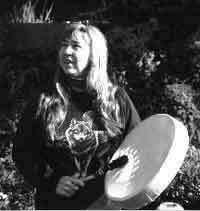 In my Circles with women, we usually have one all night of drumming to induce this state, to celebrate, to let the power of the drums carry us beyond ourselves, and then to return us to ourselves: to re-member ourselves. Healing is remembering who we are and the possibilities of who we might become. One of the most joyful aspects of working with Women's Circles is witnessing the creative powers that are unleashed. This creativity has manifested in many women making incredibly beautiful drums and rattles and a multitude of those drums are now being played around the world. When I go to Europe, Israel, and other places, I take extra drums with me. Often these are the drums made by women from the Circles in which I teach. 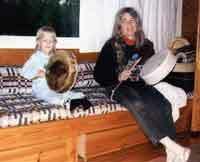 I have vivid memories of women drumming together in Ireland, and in Israel. I see the large SunDrum played by a friend in Japan. I see a trail of drums that I have taken around the world; and I know these drums are also being taken by others around the world. For the last two years (and to be continued), we established agreed upon times during the Solstices (through the internet) and do relay drumming to honor the Sun's movement from the far East until it comes to setting over the Pacific Ocean on the West coast. Participating in these ceremonies, I hear the Drum, through the many drums, carrying the power of healing and tending this Earth homemending the hoop of all our relations. Finally, I think that drumming and birthings occur together: that is, women become fertile in spirit and body when they drum. This is why we call her the MotherDrum. 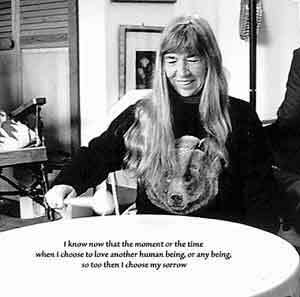 And in this birthing, I believe that all our Ancestors, who live in the stars or sleep beneath the Earth, join us in our drumming, prayers and birthing. So too the mountains, rocks, flowers, shrubs, and standing trees, brother and sister species, who walk, crawl and swim they join us in our drumming and prayers. For the drumming that we do in these Circles is with the intention to bring harmony, joy, and peace to ourselves and to the world. 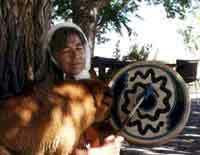 On behalf of this intention has the animal, the tree and wood, sacrificed their lives so the Drum can live in our midst.